The Minnesota Wild acquired Charlie Coyle along with Devin Setoguchi and a 2011 first-round pick from the San Jose Sharks in exchange for a 2012 second-round pick and Brent Burns prior to the 2011-12 season. This was days before the Wild also moved Martin Havlat for Dany Heatley. Trading for Burns helped the Sharks solidify another playoff berth, though they failed to move past the first round. Minnesota, on the other hand, failed to qualify for the postseason again. Coyle is still a young player at 25 years and is only in his sixth season in the NHL. In 383 games, he has posted 74 goals and 122 assists for 196 points. In the 2015-16 season, he scored his career-high in goals with 21. He followed that campaign with the best season of his career, posting 18 goals and 38 assists for 56 points. He has improved each year he has been in the league and is now playing in year three of a five-year contract worth $16 million. His cap hit is very reasonable for a player of his skill set. Coyle has the pieces to become an elite forward, with his gargantuan frame and strong puck handling. Coyle seems to be a well-liked player among Wild fans, with his jersey being one of the most popular in the stadium following Mikko Koivu, Zach Parise, Marian Gaborik and Ryan Suter. He has been on numerous playoff-qualifying Wild teams, certainly helping him earn respect among local fans. Again, he is 25 and has only thus far flashed potential. Coyle consistently puts up points for a few games, then becomes a ghost following the scoring outburst. The Wild acquired a first-round pick which they used to select Zack Phillips with the 28th overall pick in the 2011 draft. Minnesota’s 2012 second-round pick was used by the Nashville Predators, who selected Pontus Aberg with the 37th overall pick in that draft. Surely, a first-round pick is always going to be better than a second-round pick, right? The long list of first-round busts continued with the selection of Phillips. Previously, the Wild had selected A. J. Thelen, Benoit Pouliot (who has had success with other clubs), James Sheppard, Colton Gillies, and Tyler Cuma. Luckily, the Wild have seemed to rectify their past mistakes in recent drafts. Phillips, nearly seven years later, has yet to play a single game in the NHL and was traded by the Wild in March 2015. Aberg, on the other hand, has played in 44 career NHL games, registering three goals and four assists during that span while continuing to play for the team that drafted him. While neither draft pick has become a great player, Aberg has done more in his short career. Devon Setoguchi came with the promise of speed. The Sharks’ GM said, “The Wild will like him.” He lasted 117 games in a Wild sweater, registering 32 goals and 31 assists for 63 points in two seasons. Setoguchi is no longer playing in the NHL but has moved to Adler Mannheim in the DEL. During his tenure with the Wild, Setoguchi showed flashes of what made him a key piece in the blockbuster trade. The Sharks made a terrific play in moving the three time 20-goal scorer while his value was still high. Brent Burns was a fan favorite in Minnesota. Burns was one of the top players on the team, but lack of postseason success led to the Wild feeling the need for more scoring. He played in 453 games for the Wild, tallying 55 goals and 128 assists for 183 points. For the Sharks he has played in 470 games, totaling 122 goals and 229 assists for 351 points. During the 2016-17 season, Burns earned his first James Norris Memorial Trophy, awarded to the best defenseman in the NHL. He also won the NHL Foundation Player Award during the 2014-15 season. Wild fans have watched as Burns has helped lead the San Jose Sharks to the Stanley Cup Final. Meanwhile, Minnesota fans had to wait a season before acquiring their own top-end talent in Parise and Suter. Although, with Burns the Wild may never have pursued Suter as a free agent. Thus the trade has perhaps produced a butterfly effect. It’s hard to compare the two players since they play different games, but both are extremely skilled defenseman in the NHL. 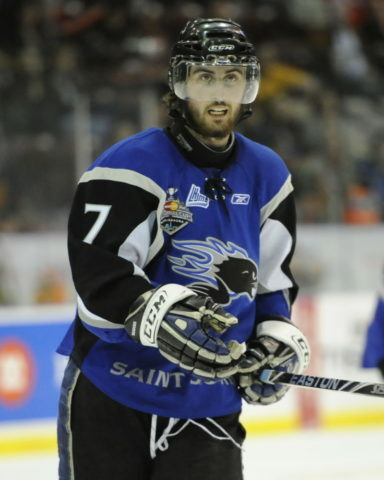 Coyle has played in 39 playoff games, totaling seven goals and eight assists for 15 points. That is a huge reason why the Wild have failed to win playoff games. He has consistently improved every year during the regular season but has only managed solid numbers during one playoff run. In the 2013-14 playoffs, Coyle played in 13 games notching three goals, four assists for seven points. He has a big body and theoretically should be able to sheild himself from other players and carry the puck. Unfortunately, he seems to be another inconsistent talent. The results of the big trade between the Sharks and Wild are mixed. 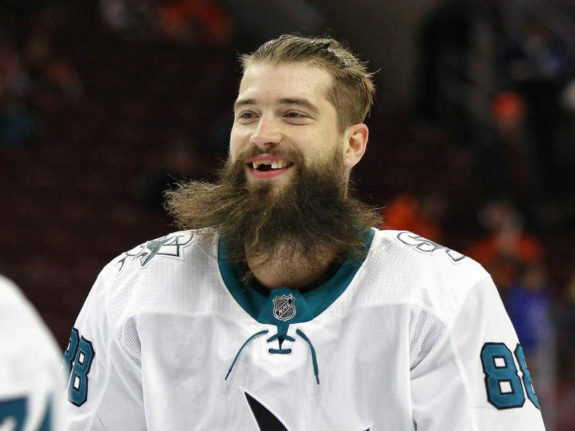 The San Jose Sharks added 351 points and two individual NHL player awards for acquiring Burns. The Minnesota Wild added 259 points between their three additions while two players aren’t even in the NHL anymore. The Sharks won this trade by acquiring a top-notch defenseman in exchange for one solid forward. In the 2017-18 season, Coyle has played in 30 games with four goals and 15 assists for 19 points. In his last five games, he has a total of two assists and his play is unbelievably bad. Every major prospect that the Wild used to convince Parise and Suter to come to the State of Hockey has lived up to their potential except for Coyle. His cap hit makes him appealing trade bait for a team that wants to take a risk on a big bodied forward. The Wild lost the trade and Coyle is now the team’s weakest link.